Det’on Cho Corporation is excited to be searching for a new Graduate Intern. This position offers a one-year work contract with a competitive salary, good benefits, and challenging and relevant work in your field of study. We Le Dai Corporation is seeking a reliable individual to fill our security post. 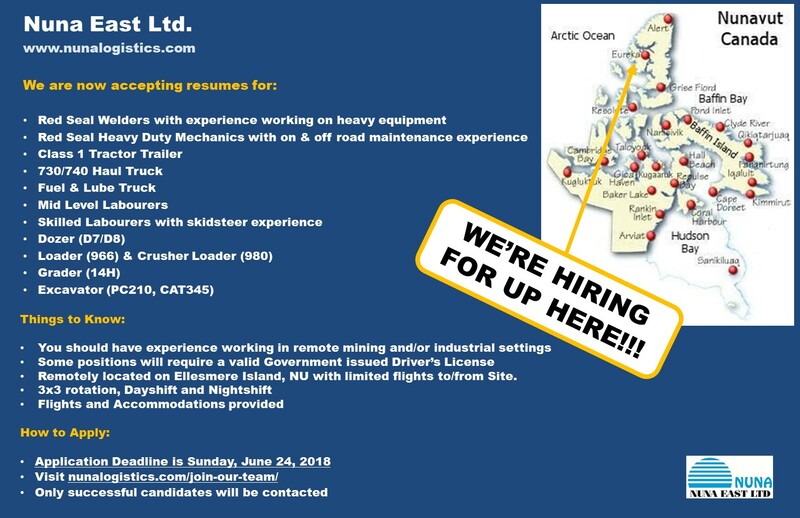 Nuna Logistics is hiring for various Heavy Equipment and Red Seal Journeymen positions for their Eureka location in Nunavut, those who are interested must have previous working experience working in a remote mining and/or industrial setting. Under the supervision of the Manager, the Shuttle Driver is responsible for transporting patients, clients’, goods and materials back and forth from the Vital Abel Boarding Home to various locations. Under the direction of the General Manager, the Cook oversees and aids in the development of food preparation at the Vital Abel Boarding Home. Det'on Cho Scarlet Security Services Ltd., a division of the Scarlet Group of Companies, is seeking full-time Security Guards to join our team in Yellowknife. Successful applicants will provide security services on our Giant Mine Project. Under the supervision of the Manager, the Casual Maintenance worker is responsible for general maintenance duties at the Vital Abel Boarding Home and all Det'on Cho Buildings. The Maintenance Labourer is a key member of the Bouwa Whee Catering team on site. The position reports to the Camp Manager, and is instrumental in ensuring that the high standards of safety and quality expected by Bouwa Whee Catering is consistently achieved in providing camp maintenance services to our client at Gahcho Kué Diamond Mine. The successful sponsorship applicant will be eligible for financial support in the 2018-2019 academic year. Apply now for the Parsons student sponsorship! It is open to all Indigenous Yellowknife area students. Must be dependable and possess strong organizational and communication skills. Must be willing to work Saturday’s in June and Monday to Friday July & August. In encouraging students to excel to higher levels of education, Kete Whii/Procon Joint Venture is offering five (5) $1,500 scholarships to successful candidates. We are currently accepting applications for students enrolled in the 2018-2019 school year. The Det'on Cho Corporation is seeking 3 post secondary students to join our team. Possible fields of work include hospitality/healthcare, administration and construction. If you are a low-time pilot looking to get a 'foot in the door' with a reputable aviation company, Summit Air has current and future opportunities for Pilots-in-Waiting at our base in Yellowknife, NT. As a Pilot-in-Waiting, you will be an integral part of the Summit Air team in the role of Ramp Attendant, gaining exposure to our fleet of both passenger and cargo aircraft. You are a qualified Helicopter Pilot looking to join the team at Summit Helicopters. This opportunity will provide term coverage from March to October 2018. There may be opportunities to move into a full-time pool position. You have a minimum 2,000 hours total time, and hold a Bell 407 endorsement. This role would be positioned dependent on operational need. Reporting to the Chef at Gahcho Kué Mine Site, the 3rd Cook is responsible for assisting the baker, helping with sandwich production and breakfast as well as other duties. The 3rd Cook is also expected to demonstrate a willingness to take initiative, a solid knowledge of food safety procedures, and the ability to creatively develop new and exciting salad recipes for the salad bar. Are you looking for a hands-on opportunity where you aren't trapped at a desk all day? As a Ramp Attendant, you will be part of our aviation grounds crew, ensuring our fleet of aircrafts takes off safely and on time. Your love for labour and a job well done will be an asset to our ground handling team in Yellowknife, NT. Join the growing Summit Air team - apply today! You are a detailed oriented person with a background in shipping or warehousing with an interest in the aviation industry. You will be responsible for providing support to the Stores team, counting inventory and entering data into the tracking system in the warehouse. Project located in the Kitikmeot Region. QC-Scarlet Security Services Ltd., a division of the Scarlet Security Group, is seeking Security Guards to join our team in Northern, NU. Working a 2 week on/off rotation in a fly in/out position, successful applicants will provide security services at a mine in Northern Nunavut. QC-Scarlet Security Services Ltd., a division of the Scarlet Security Group, is seeking local Security Guards to join our team in Cambridge Bay, NU. Working a 6 week on/off rotation, successful applicants will provide security services at the Canadian High Artic Research Stations (CHARS) in Cambridge Bay, Nunavut. Under the supervision of the Manager, the Weekend Receptionist is a rotational shift worker responsible for: Welcoming new clients, answering telephones and referring calls or taking messages, assigning patients and/or escorts rooms, communicating with Drivers on pickups, drop offs and deliveries of patients prescriptions, helping to arrange travel with relevant agencies, performing light housekeeping duties and assisting with general administrative duties. Positions required immediately – indicate what position you are applying for when submitting your resume. Email resumes to jobs@nahannincl.com , or drop off at their main office in Yellowknife at 100 Nahanni Drive. Advanced Medical Solutions Inc. (AMS) has career opportunities for local Equipment and Logistics Associate, Advanced Care Paramedics, Emergency Medical Technician (EMT) and/or Primary Care Paramedics (PCP) for projects in Yellowknife, NT. Are you looking for a new challenge, gratifying career and a company that values their employees? Then you’ve come to the right place. Advanced Medical Solutions Inc. (AMS) has career opportunities for Emergency Medical Responders (EMR) located in various areas throughout Northwest Territories. Local candidates are preferred. ​Det’on Cho Corporation is the economic arm of the Yellowknives Dene First Nation. We are currently requesting resumes in many different areas to build a skills/interests database to assist members gain employment within Det’on Cho Corporation and its Group of Companies. DT Electric Ltd. has a variety work in the electrical industry. They are currently seeking applications with commercial and residential experience to join their team. Please send resumes to info@dt-electric.ca.